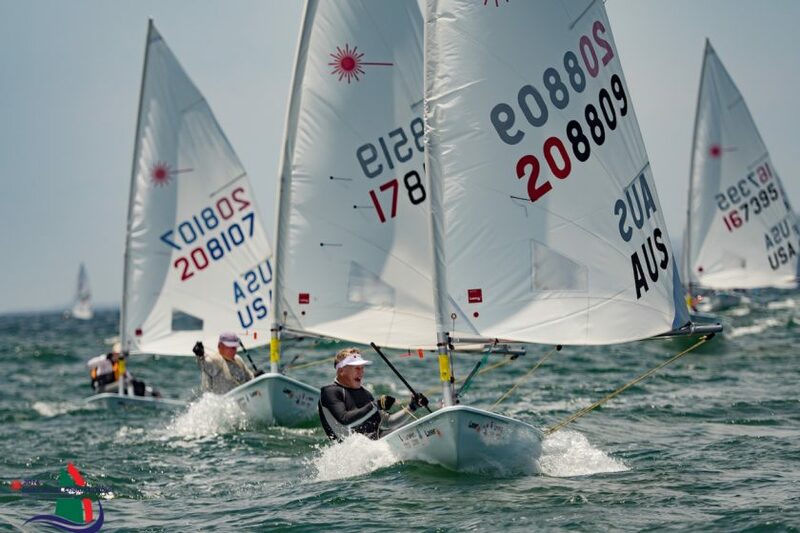 The Laser Masters World Championship for Radials completed two more races today. Race Committee postponed while the afternoon thermals built, but started the first race at about 1330h, 30 minutes after the scheduled start time, in 7 knots of breeze. The wind built over the afternoon, to 13 knots, shifting left and requiring several adjustments to the alignment of the trapezoid course. With four races scored, sailors can now discard one race from their overall total. Scott Leith (NZL) maintained his lead in the Apprentice division, with a first and second (discarded), followed by Jon Emmett (GBR) and Alejandro Rabago (MEX), as before, although Rabago had to discard a 16 from his U-flag disqualification for starting early in Race 3. Carlos Edwardo Wanderly (BRA) likewise maintained a strong lead in the Masters division, discarding a second, followed by Alessio Marinelli (ITA) and Richard Blakey (NZL). Australia is currently dominating the 49-boat Grand Master division, with Jeff Loosemore still in the lead, followed by Vanessa Dudley and Greg Adams. But Jean-Yves Fillion (USA) is tied with Adams in points, in fourth place only on a tie-breaker. Kathy Luciano (USA) won Race 4, but double-digit finishes currently keep her out of contention. William Symes (USA) moved up to lead the 36-boat Great Grand Master division, discarding his third from yesterday, with Robert Lowndes (GBR) dropping back after having to discard a Did Not Compete (DNC) in the first race today. The United States continues to lead the 75+ division, with Peter Seidenberg and David Hartman in first and second, but closely followed by Kerry Waraker of Australia. One more day of racing is scheduled before the midweek layday, with three more race days scheduled starting Thursday.